Love folk art but could do without the folk? 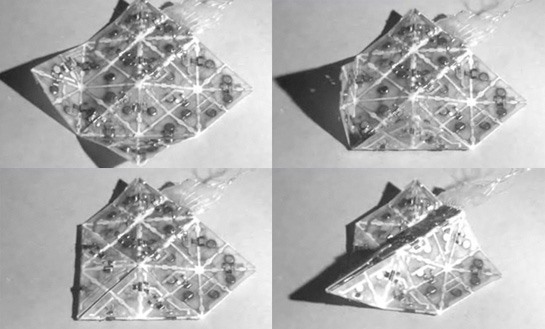 Prepare to have your heart stolen by a self-folding origami automaton. Scientific American writes, "Researchers at Harvard University and the Massachusetts Institute of Technology (M.I.T.) 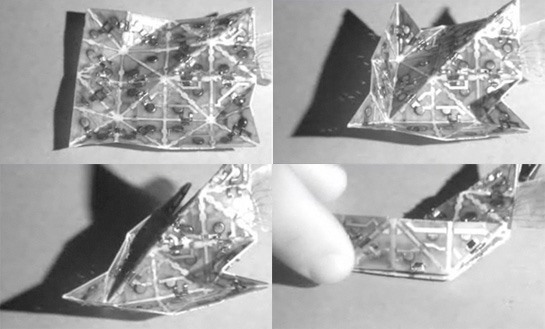 have invented a real-life Transformer, a device that can fold itself into two shapes on command." "The system [...] consists of a thin sheet of resin–fiberglass composite, just a few centimeters across, segmented into 32 triangular panels separated by flexible silicone joints. Some of the joints have heat-sensitive actuators that bend 180 degrees when warmed by an electric current, folding the sheet over at that joint. Depending on the program used, the sheet will conduct a series of folds to yield the boat or airplane shape in about 15 seconds." "In the near term [M.I.T. robotocist Daniela] Rus envisions the computational origami technology forming the basis of three-dimensional display systems—for instance, maps that can reproduce the topography of a given region on demand. 'You can imagine making machines that have the ability to give you three-dimensional views of the objects they render,' she says. In the more distant future programmable matter applications might move beyond mere shape mimicry to involve programmable optical, electric or acoustic properties."